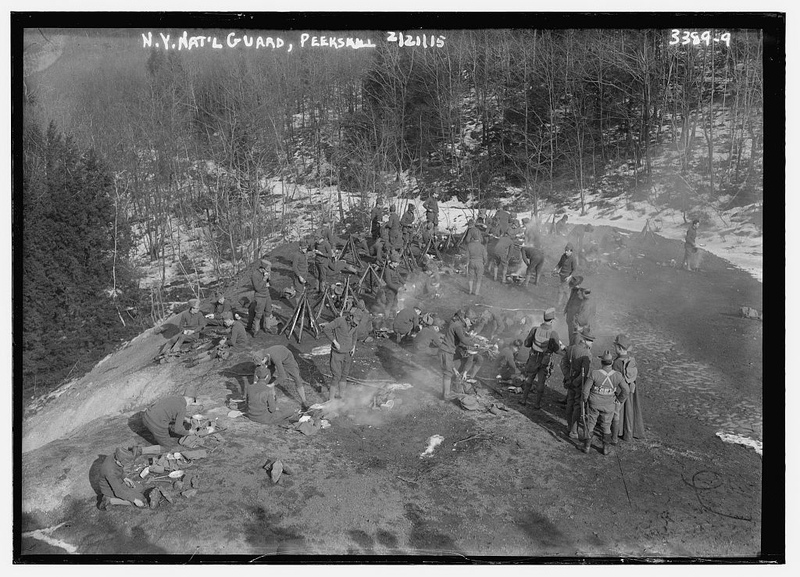 Maneuvers at Peekskill | N.Y. National Guard c.1915 | A Continuous Lean. 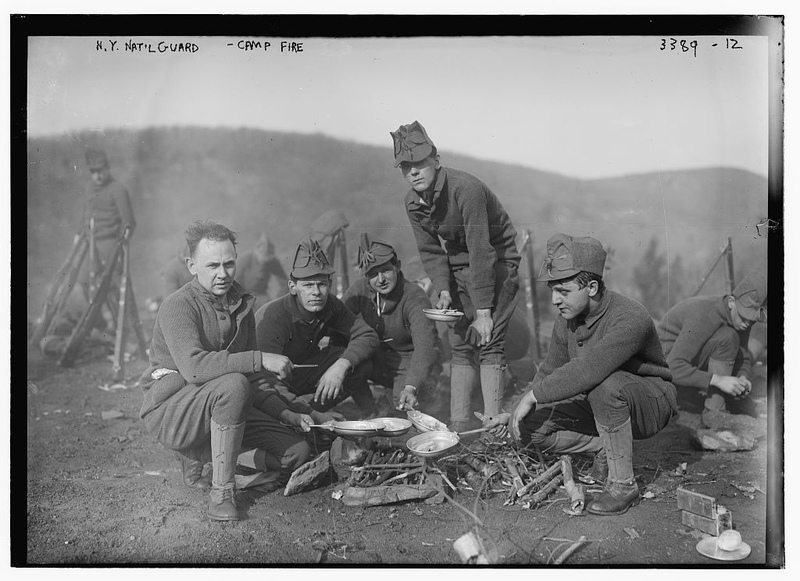 The Library of Congress never ceases to amaze me with its incredible archive of images. 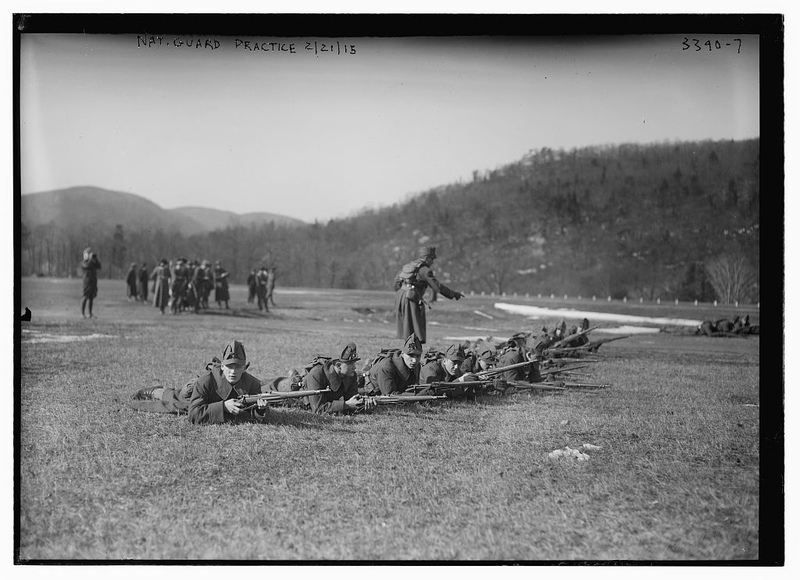 While going through a collection of newly digitized photographs, I came across this set from 1915 which documents a winter training maneuver of a New York National Guard unit in the Westchester County town of Peekskill, N.Y. Looking back, one could only assume that these soldiers ended up in Europe a few years later as part of the American Expeditionary Forces in the Great War. 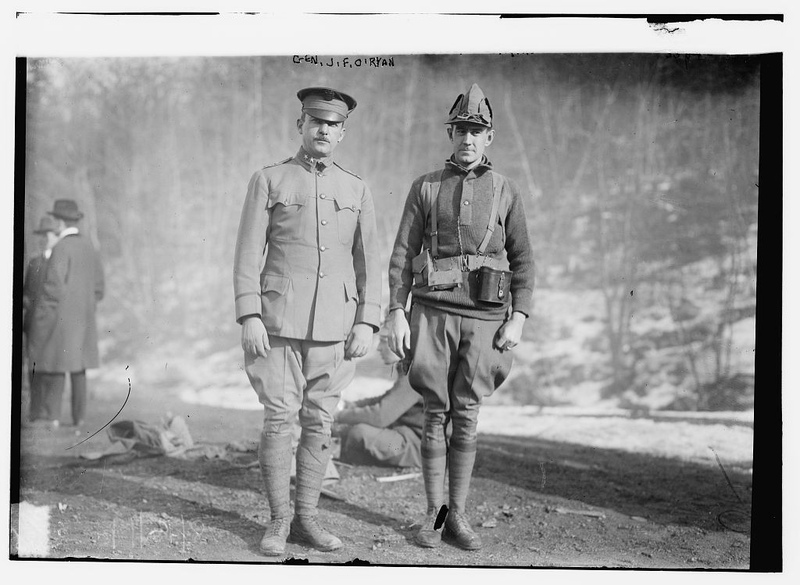 Outside of the photos themselves being beautiful (the images here are scans from glass negatives from the George Grantham Bain Collection), the uniforms and equipment are also worth noting. The wool jackets, rough sweaters and those crazy looking hats (someone get Stormy Kromer on the horn to reproduce those bad boys) are all pretty ace, especially in black and white. Even the jodhpurs and boots are themselves pretty cool looking –though that type of look is all about a time and a place. 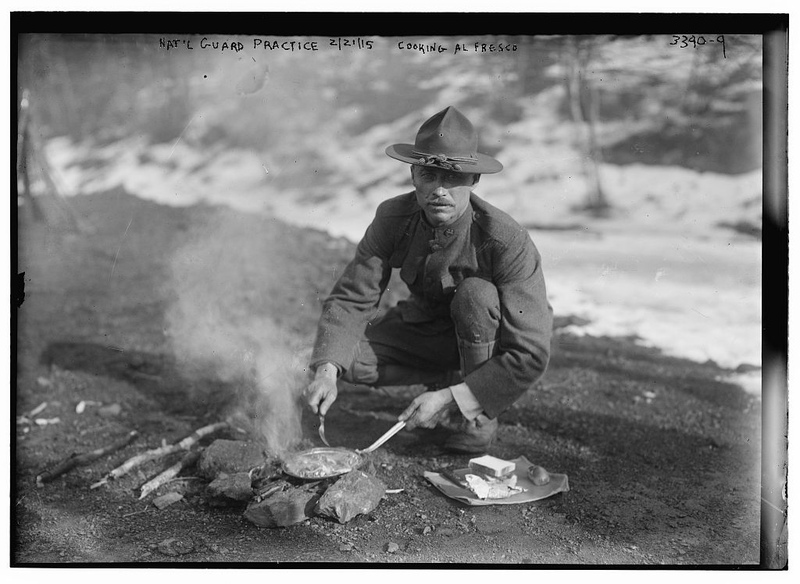 Soldiering maneuvers in 1915, yes. Madison Avenue in 2012, not so much. True that. A great look made even better by, as you note, black and white. I would shudder to actually wear this stuff. First of all the boots are a deep redolent pot for trench foot. (Very prevalent and very unpopular in WWI. Look it up.) And then there’s the fabrics. I don’t know if you have ever worn a genuine US Military wool great coat from the pre-Vietnam era, but I have. Let me tell you that those things could sand your skin right through a shirt. The sharpness and shallow depth of field of the photos make them look almost surreal. Proves that it doesn’t take great equipment to make great photographs. As one who idled more than a couple of weeks a summer at Camp Smith (still NYS ArNG Officers Training site), I got a real kick out of these. The best part was its proximity to NYC, south by train; and north by car to West Point, the Army’s crown jewel and also happens to have a great PX. And of course, just being in the most dramatic-scenery area of the Hudson Valley had its natural beauty appeal for a River rat like me. 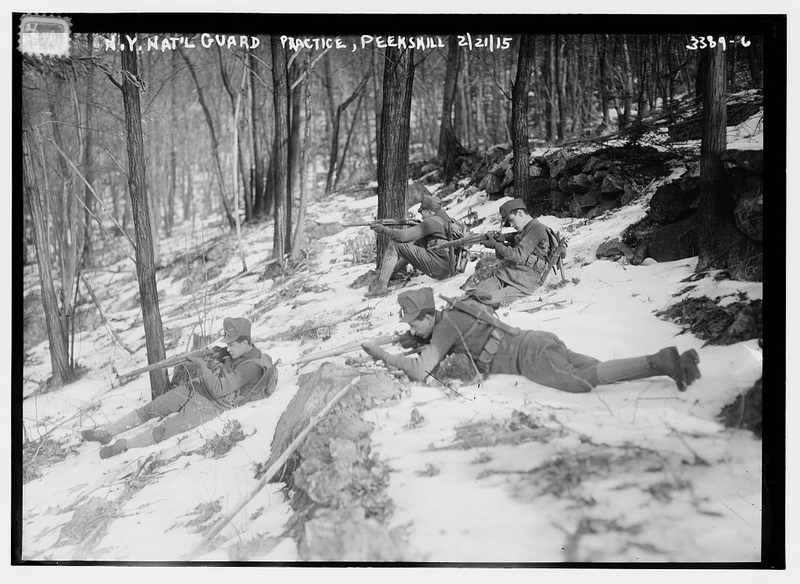 Looks like what later would be called “O’Ryan’s Roughnecks” the 27th NY Division in WWI. 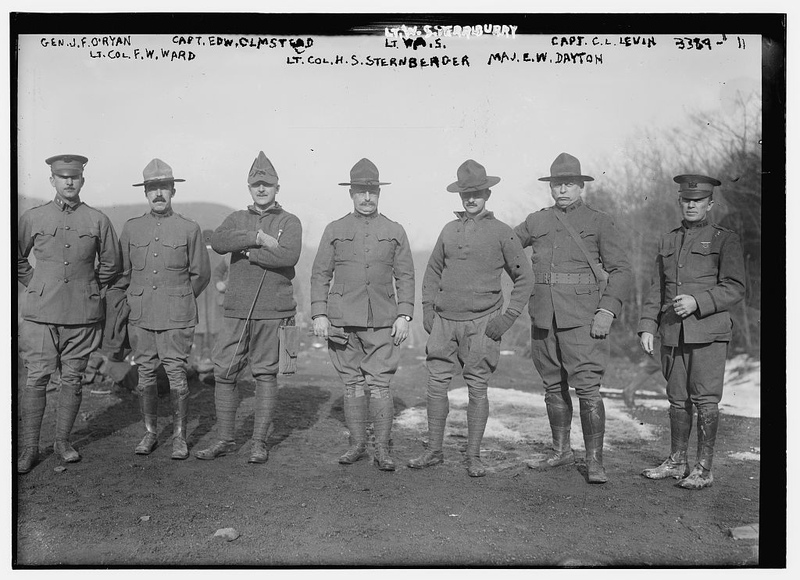 Look at those beautiful M1903 Springfield Rifles and those service hats (campaign hats) with the “Montana peak”. 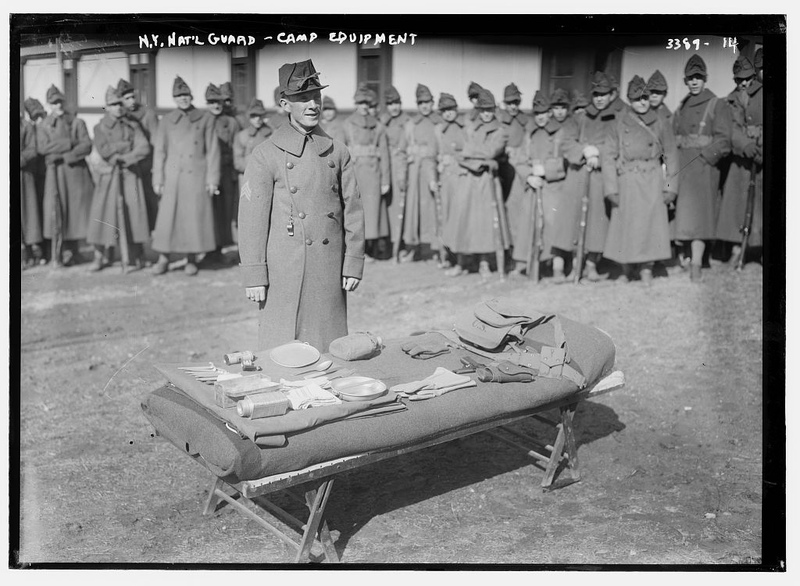 I am somewhat surprized at the spiral puttees General O’Ryan and some others are wearing as I thought puttees were only adopted after the American Expeditionary Force landed in Europe in 1916. The dramatic poses of officers in that line-up makes me chuckle, especially the LT cocking his hat forward to look like some tough TI. Ah, but it was great equipment! Few photographic processes can parallel the clarity and beauty of a 4×5 camera. It is a sad occurrence that today’s world so readily rejected film for the new medium of digital on the assumption that its ease and convenience equates to better pictures. There are still a few photographers out there that shoot on large format film, but they are dwindling!